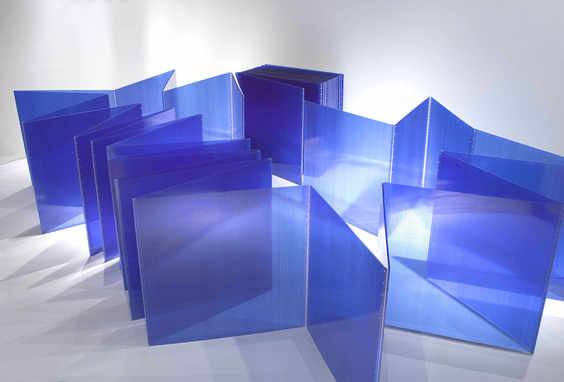 Marta Chilindrón, Cubo azul 48 (Blue Cube 48), 2006. The Phoenix Art Museum announced that it has received a significant gift of contemporary Latin American artworks from arts patron Nicholas Pardon, cofounder of the SPACE Collection, which has the largest holdings of post-1990s abstract art from Latin America in the United States. The gift includes 112 artworks by forty-nine artists from fourteen countries, including Chile, Colombia, Guatemala, Honduras, Nicaragua, and Puerto Rico. Assembled by art historian Cecilia Fajardo-Hill, the SPACE Collection is housed in a private museum in Irvine, California, and includes drawings, paintings, collages, mixed-media works, site-specific sculptures, and video installations. Pardon’s donation grows the museum’s holdings of contemporary Latin American art by 280 percent. Previously, the institution had only forty contemporary Latin American artworks in its permanent collection. An exhibition featuring the newly acquired pieces will be staged in 2020.